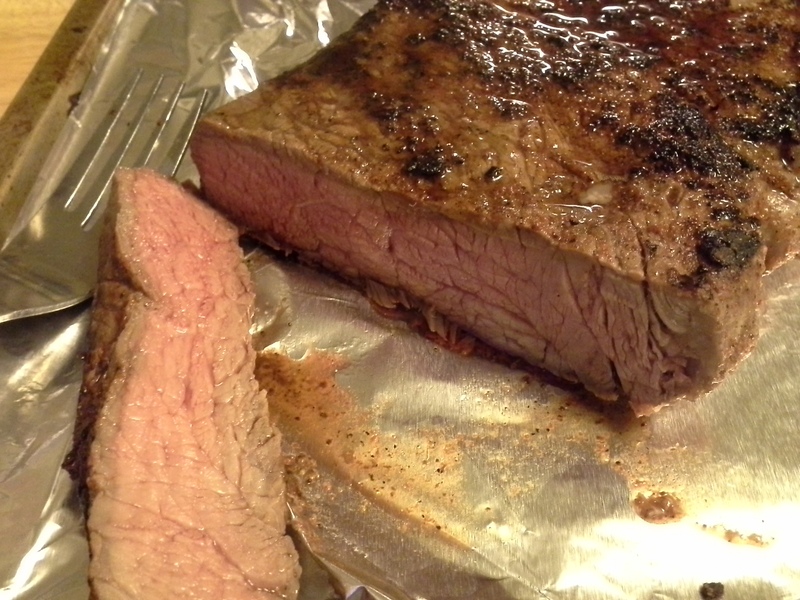 London Broil is one of those old-fashioned cuts of meat that sound intimidating but are, in actuality, very simple if you know the basics. It can also, occasionally, be up to $2 cheaper per pound than top sirloin or other cuts that are more popular. 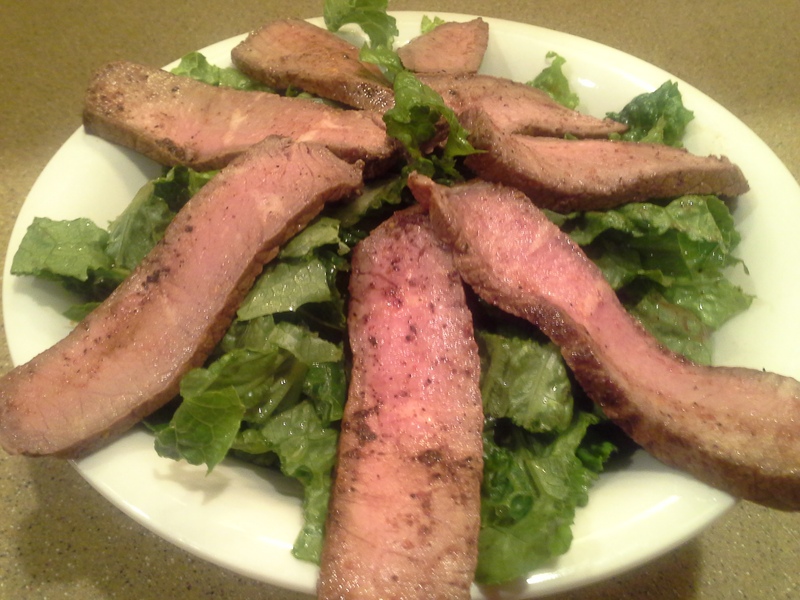 While London Broil is great to eat hot and sizzling straight from the oven, it’s also a cut that’s great eaten cold on a salad or as a snack. So it’s well worth it to add this to a low-carb cooking repertoire. Tools: Heavy-bottom skillet and baking pan or cast-iron or other skillet that can go from stove top to oven. 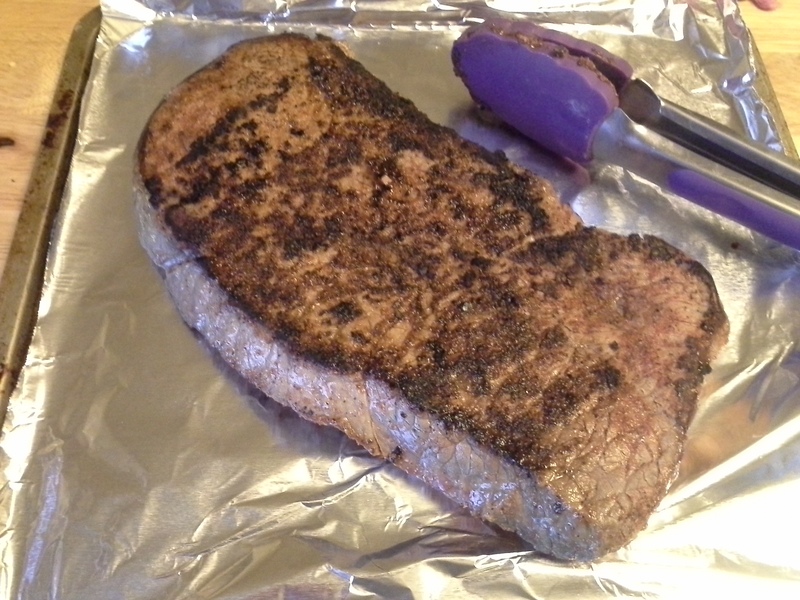 Before heating the skillet, make sure it’s large enough to hold your London Broil slab. Preheat oven to 325°F (toaster oven 350°F). Remove meat from packaging and pat dry. Coat meat with Tony’s. Heat skillet over medium-high heat for five minutes. Let meat sit five minutes while skillet heats. Once skillet is preheated, sear meat on each side for 3 minutes. Seared and ready to be finished in the oven. If not using an oven-safe skillet, transfer meat to a foil-lined baking pan. Roast in oven approximately 15 minutes (for medium-rare)—or until meat reaches desired temperature for the doneness you desire. However, because it is relatively lean, anything over a medium doneness is going to turn this meat into shoe leather, so medium-rare (130-135°F) to medium (~140°F) is recommended. If you plan to reheat the leftovers at a later time, medium-rare is your best option so that when it’s reheated, it doesn’t overcook. Don’t lose any of those juices when it comes out of the oven! 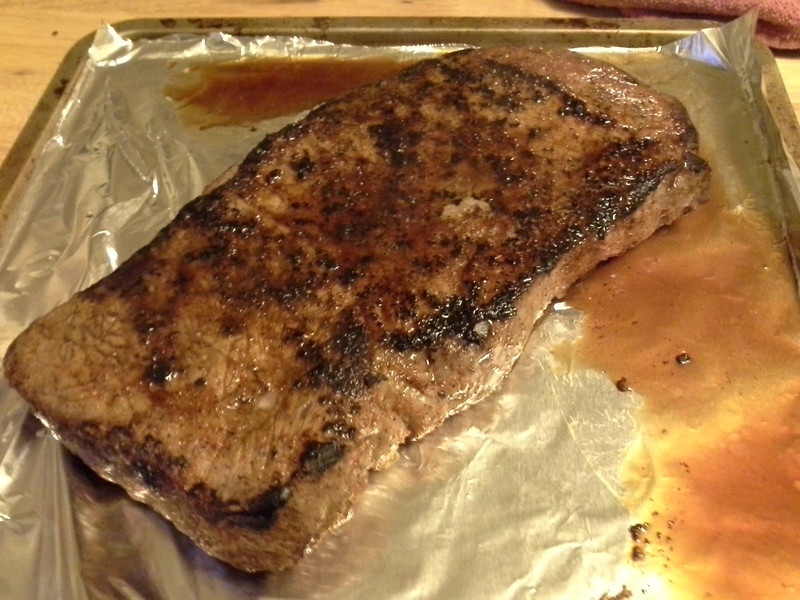 Fifteen minutes in the toaster oven gave me this perfect medium-rare all the way through. For immediate consumption: Slice thinly across the grain and serve immediately. Use your sharpest knife to get the thinnest cuts. To eat later: Let cool completely. Slice thinly across the grain and package into 4 to 6-ounce serving sizes in zip-top bags. This is the perfect cut of beef to add to a salad—not fatty but still juicy and with great flavor and texture. I used Tony’s because it’s one of my favorite season-alls (I dressed the salad in the bottom photo with homemade guacamole—1/2 avocado + 1 tbsp. salsa—and all the spices worked really well together). 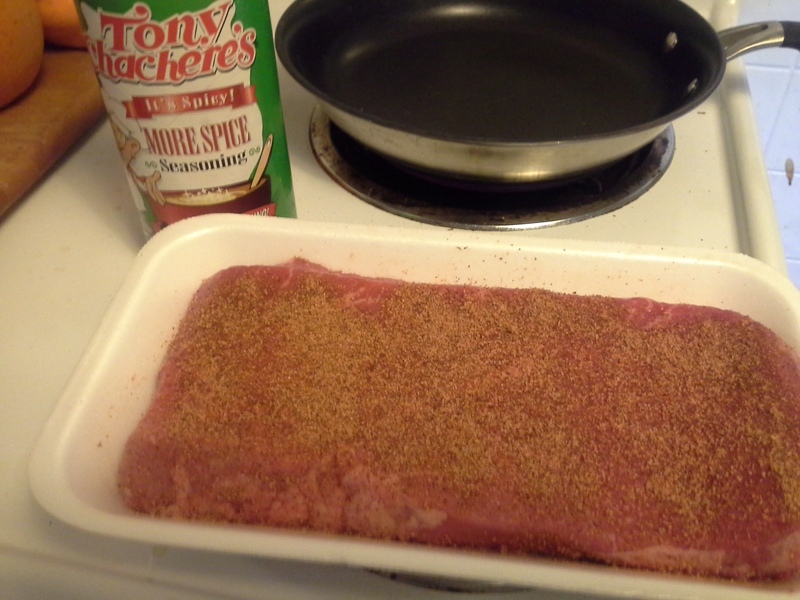 Use whatever seasonings/spices you like with your beef. A simple mixture of salt, pepper, granulated garlic, and onion powder (just a tiny touch of this), would be great if you’re going to use the meat in other dishes that already have specific flavorings. Other spices, such as curry powder or dry Zesty Italian dressing mix, can make this a great addition to a meal with a specific ethnic focus. 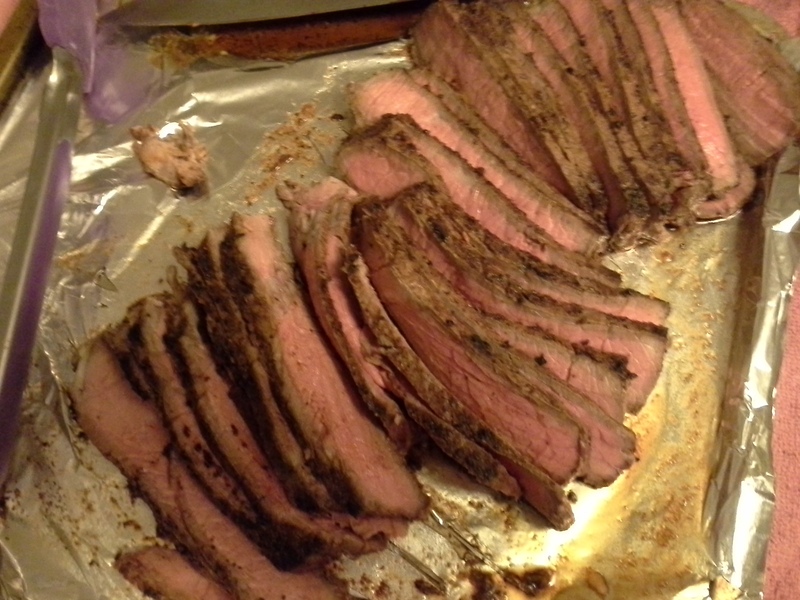 That’s the greatest thing about London Broil—it’s so easily adaptable.